We are sold out of the (A) Two large Space Invaders (Top Pillow). Thanks. «©NCSX» The 30th Anniversary of Space Invaders is in full swing and Taito's been celebrating the historic event with numerous merchandise offers and preorders. 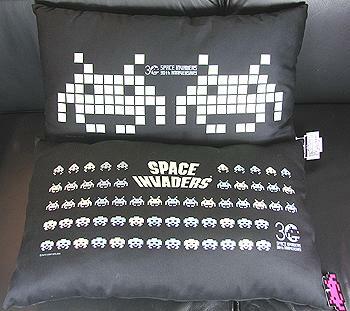 The latest product released in Japan a few days ago is the Space Invaders 30th Anniversary Pillow. Each pillow measures 53cm (20.86") in length and 33cm (13") in width which is larger than Taito's original measurements when they started accepting preorders. The pillows are big enough to accommodate human heads, pets, and assorted wide loads. Due to the size of each pillow, NCS recommends only shipping by UPS Ground within the United States or USPS Airmail for our international customers. Using any sort of domestic air service will incur onerous fuel-surcharge-laden shipping charges. View larger photos for the Space Invaders Pillows on the main NCSX website.